This happens every Sunday that I am home. A big batch of granola is made to stock up for the week. First off, even at the most affordable markets, the price verses quality of packaged granola drives me completely nuts! The worse brands are too much money. And half the time it’s rancid, which is what happens when nuts and seeds are left too long at the wrong temperature (always keep yours in the freezer). Anyway this Golden Granola is the simplest recipe that I developed when the kids were young. Given that I never stocked crappy sweet snacks, this did triple duty for breakfast, snacks, and midnight munchies. Put your own style on the basic process. Here I add honey, but you can use maple syrup, agave or coconut nectar–anything that is dissolves in water to sweeten. There are no spices just vanilla, but you can omit that and add what you love (from the sweet spices) just not too much. Swap coconut or olive oil for the safflower. 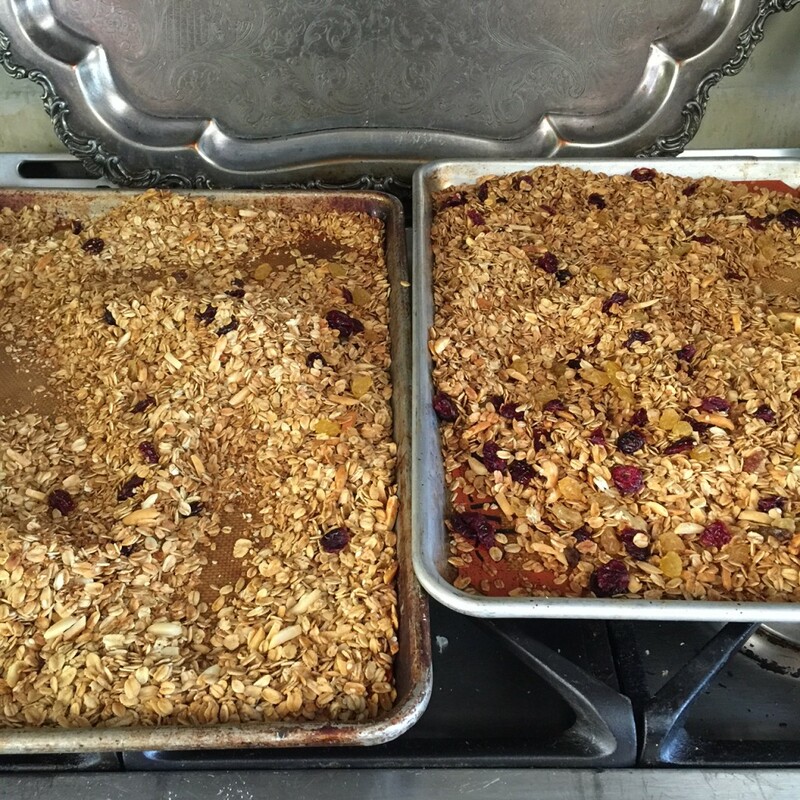 But the oat to nut to liquid to dry fruit ratio is a good one, as is the cooking time and temp. Cool and store it in resealable bags or a container with a tight lid. This came out of the oven a half an hour ago, and already half of one tray is gone (my point–mid afternoon snacks). But I’m ok with that. I love your show….I miss it very much.I hope u come back soon. Click on Golden Granola inside the post for the recipe.